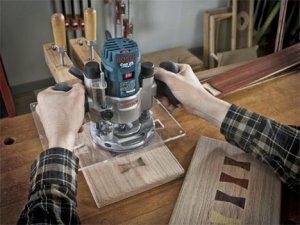 The PR011 is a true plunge router base that has all of the functionality you would expect in a true plunge router. It can easily switch from its fixed base and attach to the new plunge base with its quick release tool-less connection. To begin plunging, the plunge lock lever is located near the left handle easily within reach and is spring loaded to return to the lock position. 5 preset depth stops along with 2 users adjustable stops are sure to cover all the common uses of a plunge base. Unlike other plunge bases, Bosch chose to use a completely round sub-base that features a precision centering design. The round base does make it easier to follow a straight edge no matter how you hold the router, but if the base does go out of center you will have issues. a Colt router, fixed base, plunge base, 10-millimeter shaft wrench, 17-millimeter collet wrench, PR002 Straight Edge Guide and a carrying case.